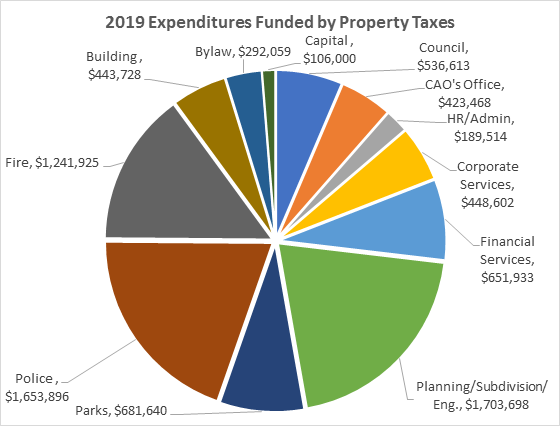 Did you know that the District of Sooke has an interactive property tax calculator that allows residents to see the estimated municipal portion (approximately 42% of total taxes collected) of their property taxes for 2019 and the ways in which these funds are used? We’ve recently updated the calculator for 2019 using the DRAFT 2019-2023 Five Year Financial Plan. By entering the assessed value of your home, the property tax calculator will show an estimate of how your 2019 tax dollars will be allocated to services such as policing, fire protection, parks maintenance, and capital projects. The impact of increased or decreased funding to each service area is also outlined, creating a glimpse into the process of municipal budgeting. The Property Tax calculator can be found here and more detailed information regarding property taxation can be found by clicking here. This entry was posted in District News, News. Bookmark the permalink.